Produced for the Broadway Stage by David Merrick and Champion-Five, Inc. 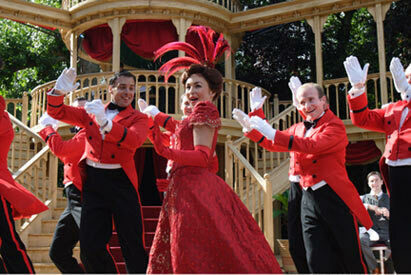 This high-spirited revival of Jerry Herman’s smash 1964 Broadway musical, Hello Dolly! is a timely one, in that its’ composer garnered a Tony Award earlier this year for his invaluable, lifetime contributions to the theater which, in addition to Dolly also include the equally long running smash hits La Cage Aux Follies (Tony Award – Best Musical 1983) and Mame (1966), each of which has been revived many times over the years. Herman still holds the Broadway record for having the most musicals performed over 1,500 times, being staged at once - three. It’s the turn of the 20th century in Yonkers, New York and middle-aged widow Dolly Gallagher Levi, who married for love first time around, has now set her cap on crotchety ‘half millionaire’ hay, feed and seed baron Horace Vandergelder. Dolly’s good ole American ‘can do’ attitude assures her success in this practical pursuit, despite the fact that she’s been acting as matchmaker for Vandergelder in order to find him a suitable wife. Dolly’s numerous talents also include dance teacher and among her impromptu pupils are a young artist and his even younger fiancée and Mr. Vandergelder’s clerks, Cornelius and Barnaby, who hatch a plot to enable them to head off to the bright lights of New York in search of adventure while Mr. V. is in the big city on business with the intention of meeting up with lovely hat shop owning widow Mrs. Malloy, the ‘match’ he is planning to marry. As Dolly’s true business is, by her own admission, ‘planning lives’, she travels to New York too, in order to steer things her way and, visit her favourite establishment, the lavish Harmonia Gardens restaurant where the all male staff are delighted that she is back in town. 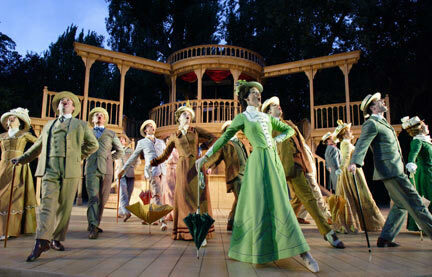 First things being first, Timothy Sheader’s directing of this production of Hello Dolly! is first rate, as the actors in the show generally manage to wring every possible laugh from each and every line of their witty script, via their intonations, inflections and/or movement, making some portions of the show seem much fresher than they might have done after all these years. But that’s also a testament to Herman’s talent for simultaneously spotting the flies in various ointments and simultaneously highlighting the idiosyncrasies of his characters through his canny lyrics, enabling the best possible kind of mirth through the laughter of recognition. Petite powerhouse Samantha Spiro makes Dolly into just the kind of woman she should be – one you initially feel overwhelmed by but eventually, come to love. Dolly is a veritable whirlwind who allows no possibility for advantage or adventure to ‘pass her by’ and Spiro’s performance embodies her go for it philosophy. Spiro’s singing in the role is admittedly, not the greatest, but she manages to work this to her advantage in the course of her performance as we’re meant to jump to the conclusion that Dolly is a barker only to finally conclude that her bark is just a smoke screen for her heart of gold. The fact that Spiro’s comedic timing is impeccable effectively erases any doubts about her credibility in her larger than life role long before the first act ends. By the show’s conclusion, Spiro’s Dolly was received with ecstatic applause and appreciation, leaving us with the feeling that we’ve visited an old, much loved friend, whom we formerly feared may have been long lost. As the show’s title song says to Dolly, I reiterate here to Ms. Spiro, ‘It’s great to have you back where you belong.’ Bravo! As Dolly’s reluctant love interest, Horace Vandergelder, Allan Corduner allows his audience the privilege of understanding that his outwardly crabby Mr. Money Bags is actually, a very lonely, vulnerable man, before his character acknowledges it himself, and manages to do so without ever losing out on laughs. Corduner’s Horace is a laudable achievement and one which adds greatly to the pleasure of watching this show, particularly during his scenes with the inimitable Dolly aka Ms. Spiro which, are an absolute delight. Corduner’s own gently moving rendition of ‘Hello Dolly’ was memorable, as were his leading vocals on the wanly misogynist all male ensemble number, ‘It Takes a Woman,’ both of which offer great contrasts to Spiro’s spirited renditions of ‘Put on Your Sunday Clothes,’ and the show stopping first act concluder, ‘Before the Parade Passes By,’ the latter of which literally makes you feel like jumping out of your seat! There are other notable performances in this production too, among them: Daniel Crossley as Mr. Vandergelder’s chief clerk, Cornelius Hackl, who at thirty-three feels it’s high time he had an adventure and Josephina Gabrielle as Vandergelder’s original intended, the outwardly serene Mrs. Irene Malloy. In a role played by a young Michael Crawford in the film of Hello Dolly! Crossley does some hilariously rubber-legged dancing when he’s ‘learning to dance’ and offers a beautifully emotive rendering of ‘It Only Takes a Moment’ when he takes to the spotlight to sing a ballad. Ms. Gabrielle as Mrs. Malloy likewise performs a wistful, longing filled version of ‘Ribbons Down My Back,’ and joins in an animated version of upper class mimicking ‘Elegance’with Crossley, Oliver Brenin and Akiya Henry as the younger pairing of junior clerk Barnaby and Mrs. Malloy’s girlishly giggling hat shop assistant, Minnie Fay. Accolades wouldn’t be complete without an enthusiastic mention of the marvellously versatile, unobtrusive sets, designed by Peter McKintosh and the crowd pleasing choreography of Stephen Mear, the latter of which drew ooohs and ahhhs a plenty. Scenery changes for this show involved several cast members, each of whom did something as swift, effortless and seamless as unfurl a banner or flick a sign, collectively creating a whole new backdrop for each scene, with every change representing yet another facet of the same versatile, mostly wooden constructions. McKintosh’s choreography is a pleasing blend of knock ‘em dead Broadway style dance manoeuvres and steps inspired by his seemingly limitless creative imagination and the results were at times, spectacular and evocative. Dialect Coach Majella Hurely also deserves praise as Dolly’s brusque remarks are all, judging by the laughs they are instantly met with, definitely, in untypically brash (for a gal of that time), American character. Then there are the incalculable contributions of Musical Director Phil Bateman, Orchestrator David Shrubsole, Lighting Designer Simon Mills and the others involved with this hugely enjoyable production to commend. Sprinkles aside, by the Finale’s conclusion, we were all one big smiling, humming crowd, once we’d stopped cheering that is. But don't just take my word for it. Hurry and get your tickets for Hello Dolly! in Regent’s Park, (whatever the weather) before the parade passes by. For groups of 10 or more there is a single transaction fee of £2.50 and no per ticket booking fee.